Express bar feels like a visit to your best girlfriend in Zagreb who happens to have an exquisite taste in home decor and puts a lot of effort into making you feel very comfortable during your stay. She serves you specialty coffee in pastel-colored cups and arranges dried field flowers on the table. There are fairy lights hung across the whole room and a general feeling of brightness to the whole place. Your macchiato is garnished with latte art, of course – a little flower made of hearts that’s meant to brighten up your afternoon and show you someone cares. She puts on Guardians of the Galaxy’s Awesome Mix so the whole setting is not just too cute. And while you spend the afternoon chatting lightheartedly, you flip through the pages of lifestyle magazines lying around that focus on good food and encourage you to plant a vegetable garden. Your friend knows what’s best for you and has also been working on herself — smoking was banned just recently in Express bar. 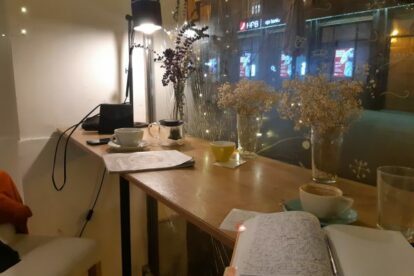 My favorite part is the coffee shop window and the table which is looking out on the central Petrinjska street, the perfect spot for watching busy Zagrebers pass by on their every-day missions. A curiosity about that window is that it’s broken, but instead of being fixed the spot where the glass burst is decorated to remind of a winter-flower.